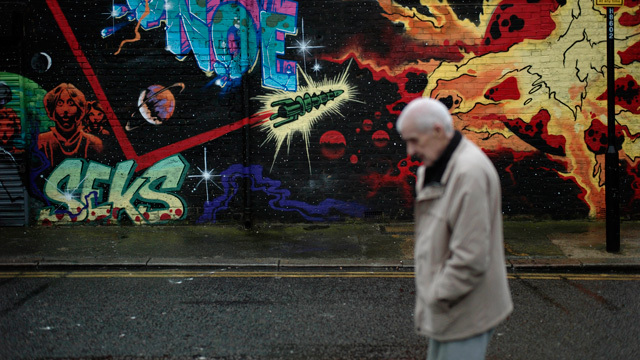 A man walks past street art in east London on Dec. 20, 2012 as the clock is ticking down to Dec. 21, the supposed end of the Mayan calendar, and from China to California to Mexico, thousands are getting ready for what they think is going to be a fateful day. intro: No offense to the Mayans, but I'm putting my money on the planet still being here next year. But let's not dismiss this end-of-the-world business just yet. Suppose you knew for certain that the apocalypse was imminent and set to occur, say, a year from now, on December 21, 2013. With only 12 months left of humanity, how would you spend your time? And what would you do about work? I realize that with the end of the world fast approaching, many would simply stop working. But what about the employees, freelancers and volunteers who like their work? What about those who feel such a sense of duty to their company, clientele or community that they'd clock in even on Earth's last day? And what about those who don't have enough savings or credit to fund a year off work? If you knew for certain that the end of days was drawing near, would you handle your job any differently? Would you work less? Focus only on the projects you believe in? Tell your boss where he or she can stuff it? I asked a handful of workplace experts for their apocalyptic career tips. Following are eight of their best suggestions. Sure, if taken too literally, some of these tips won't fly in your present-day worklife. But there's value in approaching your career as though it's your last year on the planet: with only a little more time left in the hourglass, you just might regard work and the colleagues and clients you interact with each week a bit differently. quicklist: media: title: Show coworkers your appreciation text: "While it might sound touch-y feely, giving praise and positive feedback is the ultimate office grease," says journalist Hannah Seligson, author of Mission: Adulthood: How the 20-Somethings of Today Are Transforming Work, Love, and Life. "It makes even the worst assignments and the longest days go down easier. And wouldn't it be a shame if the world ended and you never told your assistant, co-workers or boss that you valued their hard work?" quicklist: media: title: Stop the meeting insanity text: Why spend an hour discussing what easily can be covered in a third of that time? "As many savvy people have pointed out, no meeting or phone call should ever go longer than twenty minutes—those that do are the result of poor planning, people who like to hear themselves talk and not having a clear agenda. No time for any of that now that the apocalypse is coming," Seligson says. quicklist: media: title: Stand up for what you believe text: If ever there was a time to speak your mind on an issue you're passionate about, the eleventh hour is it. "So many of us, because we have to, dance around issues and don't say what we really think," Seligson explains. "These tactics might serve us well in the short-term, but my apocalypse advice is to go bat for something at work. It will make all of those months (or years) of standing by idly as bad ideas were implemented not seem as soul-crushing." If you've always wanted to start a business, no time like the ever-dwindling present to get cracking. Suppose, for example, scientists predict that a number of us might make it through the end of days unscathed if we remain indoors for several weeks after the skies turn black and the asteroids hit. Penelope Trunk, founder of the career management website Brazen Careerist, says that's your cue to embrace your inner entrepreneur. "Rebrand yourself as the premier consulting firm for stocking offices with three months of tools and food for survival if people can't leave," Trunk recommends. If you have to spend your remaining few months on the planet working, better make that labor count for something. "Don't waste time on projects that aren't challenging, are very boring and that aren't enjoyable," says Dan Schawbel, founder of the Gen Y research and consulting firm Millennial Branding and author of "Me 2.0." "Instead, only take on projects that have personal meaning for you and make you feel good about yourself and the people around you." If you have a job you can do from anywhere, start telecommuting right away, advises Cali Williams Yost, work flexibility expert and author of TWEAK IT: Make What Matters to You Happen Every Day. "Invest in the best audio and video technology you can afford so that you can feel connected with your customers and colleagues," she adds. "Then, put a lock on your home office door with a sign that says, 'Apocalypse approaches!' so you aren't tempted to work all the time." quicklist: media: title: Take time to recharge text: You have vacation days for a reason. Use them. Even better, try to negotiate another two to four weeks of vacation time, suggests Williams Yost. "Then absolutely take every single day of vacation that you are allowed," she says. "Put your days off on your calendar now, and then plan your dream trips so that nothing will keep you from going. Before you go on vacation, leave your smartphone at the office. Don't even bring it home. No need to connect with the pending apocalypse." You might not be able to afford to stop working. But with no more need for long-term savings accounts and retirement funds, perhaps you can afford to trade in an uninspiring job for work that enriches your life and the lives of others. "What better time to make every moment of work matter," says Marci Alboher, vice president of the non-profit organization Encore.org and author of "The Encore Career Handbook: How to Make a Living and a Difference in the Second Half of Life." "Ditch the money gig if you can," Alboher says. "Raid the 401k. And focus on using any gifts you have to make a difference. Enrich the life of a child. Give your time to those who don't have anyone. Ease the suffering of someone in pain. All the research shows that it feels really good to help others—so at least you'll go out smiling." Michelle Goodman is a freelance writer and former cubicle dweller. Her books include My So-Called Freelance Life: How to Survive and Thrive as a Creative Professional for Hire and The Anti 9-to-5 Guide: Practical Career Advice for Women Who Think Outside the Cube. Follow her at @anti9to5guide.